Heat stress, What kind of condition it’s? actually, first time I show this powerpoint I don’t know about heat stress at all. is that important for me to understand heat stress? and then For what ? At that time, I just looking for powerpoint in my computer, so I can share it in this blog. Because I'm little busy with my work, so I can’t share my own powerpoint. 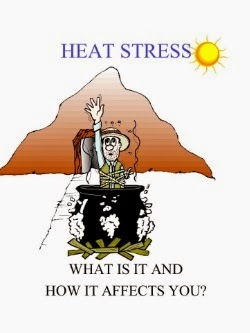 And then, I find this powerpoint about heat stress. Ok, lets talking about heat stress first. Heat stress, if I can explain with my own word, is condition that our body is losing so much water, it’s can happened when we work in extremely hot than usual body can take. For example, when someone work at as firefighters, bakery workers, farmers, construction workers, miners, boiler room workers, factory workers, and others. What the worst condition of heat stress? Heat stress can make some one to coma, and if not medical treatment it’s also can result in death. Simple Heat stress problem may result in dizziness, sweaty palms, fogged-up safety glasses and then make it increase the risk of injuries. 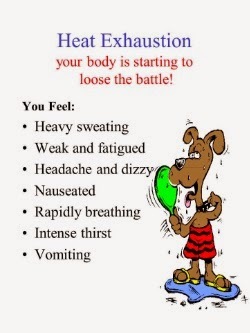 Heat stress not only cause about hot condition or environment, sometimes it’s caused by our body condition, like Unfit, Lack of sleep, Coffee/ tea and alcohol consumption, Cold / Flu / medical condition. So, make our body health it's important. There is one instrument in our body, that show our condition of heat stress, it’s from urine.The urine color show that our body need some water or not. And the best point is, you should learn to drink, even when you are not thirsty. Talking about powerpoint, this only use some animation, with no one make me interesting. But, what I think this powerpoint good enough, it’s about picture and font formation. This powerpoint use unique picture as illustration, quite good I think. So, just download from below.